Before Keren began her presentation she asked the librarians present what the top things they wanted from discovery tools. She then asked what their students wanted from discovery tools. Automated authentication – easy access and minimise the need to type. In contrast to the high degree of functionality and granularity that is expected by librarians (and academics) from discovery services, a lot of research highlights that students don’t use or require the same level of functionality (see for example this JISC user behaviour observational study: User behaviour in resource discovery). Furthermore, the functionality available on mobile devices is often constrained, so there’s inevitably a balance between usability and functionality when developing for mobile. A number of the participants echoed Keren’s analysis, arguing that increasingly library users want a Google like experience. This includes assumptions that the library discovery services will learn more about them the more they use it, a certain level of personalisation – something which is still in its infancy for library discovery services. 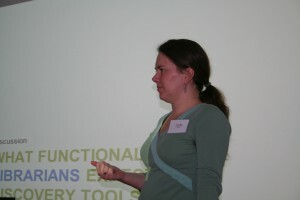 Keren stressed the importance of consulting users (students and researchers). One of the big problems with the academic environment is the diversity of the use-cases. It’s important to be clear about who your core audience is (Keren stressed the importance of extracting value from things like analytics, surveys, interviews etc). It was also clear that libraries should be adopting a ‘mobile first’ policy: start with mobile, and work from there. This approach helps you focus on exactly what you’re trying to deliver. It’s also beneficial in terms of accessibility and usability, as developing services for mobile incorporates best practice for accessibility. The clear message from the session was that as professionals we can have very different expectations from the average user and heaping on all the functionality used by expert searchers can overwhelm less experienced searchers who are mostly looking for convenience, especially when they’re using a handheld device. Keren was keen to leave us with a philosophy of reduction wherever possible: reduce the number of required clicks, downloads, and scrolling. If students do have to download (and this is likely as libraries usually don’t create the content they serve) minimise the volume of the downloads. Less, it seems, is definitely more. Keren’s presentation is available on Slideshare (http://www.slideshare.net/mirya/resource-discovery-on-mobile-devices-keren-mills) and you can read more about this topic on the MACON project blog. This entry was posted in Events, Project news and tagged event, macon, mlibs, mlibs event, resource discovery on May 31, 2012 by Jo Alcock.